If you’re looking for inexpensive, portable, and fun sensory processing disorder activities and toys to help your sensory sensitive child, this collection of ideas will not disappoint. Whether your little one is a sensory seeker or avoider, needs proprioceptive and/or vestibular input, or struggles with tactile, auditory, and/or oral sensitivities, we’re sharing 26 ways you can work on these challenges in a non-threatening way at home, in the classroom, in therapy, while traveling, and beyond. Also known as SPD, sensory processing disorder is a neurophysiological condition that makes it challenging for the brain to interpret and process information from the body’s different senses correctly. In some kids, sensory processing challenges can cause them to become OVER (or HYPER) sensitive to certain sensory stimuli, while in others is can make them UNDER (or HYPO) sensitive. Sensory processing disorder can impact one of the body’s sense, or many sense at the same time, and can lead to life-long social, emotional, and academic difficulties, and while many children with autism have a comorbid sensory processing disorder diagnosis, the two are very distinct disorders, and most kids with SPD do not fall on the autism spectrum. As with autism, the symptoms of sensory processing disorder live on a spectrum, and tend to be specific to each child. SPD can impact one or many senses, and can cause children to seek or avoid certain sensory stimuli. Keep in mind that most children have certain sensory sensitivities – for example, a child may really dislike the sound of fire engines, the taste of bananas, or the feel of cream on his or hands – but sensory processing disorder goes much deeper and significantly impacts the ability of a child to function from day to do. Demonstrates an extreme response to sudden noises (fire engines, vacuum, toilet flushing), touch (hugs), etc. Extreme tolerance for pain, temperatures, etc. Kids with sensory processing disorder are prone to tantrums – also called sensory meltdowns – and their parents often describe them as being very fussy when they were babies. If you believe your child may have sensory processing disorder, it’s important to speak with a licensed professional for a complete evaluation and treatment plan. The information shared above is merely to give you an idea of the kinds of behaviors to look out for, but is by no means an exhaustive list of the symptoms of sensory processing disorder. Since the symptoms of sensory processing disorder live on a spectrum, are specific to each child, and affect one or many of the child’s senses, treatment is often highly individualized to address the needs of each child. Occupational therapists use sensory integration therapy to expose children with SPD to certain sensory stimuli through repetitive activities in an effort to help them properly integrate and respond to sensory input. Exposure is gradual and performed in a fun and non-threatening way in an attempt to make the child more tolerant to certain stimuli over time. Trampoline fun. Jumping isn’t just fun – it can also be very calming and help improve body awareness in space while simultaneously helping to burn off energy. If you have an outdoor trampoline, you can create all kinds of fun games and activities for your child to enjoy, but indoor trampolines can be just as effective and many fold up so you can take them with you when you travel. DIY crash mat. A crash mat can be very beneficial to kids who need proprioceptive input as it gives them a safe place to land while they are jumping or tumbling. You can buy ready-made crash mats, but if you’re tight for space and/or funds, or need an on-the-go option, try placing several large pillows on the floor and then covering them with a bunch of blankets. Just be careful the floor is COMPLETELY covered with enough pillows so your little one has a safe place to land, and that he or she isn’t jumping head-first onto the mat. Jump rope. Jumping is another great, inexpensive, and portable activity to help provide proprioceptive input. Grab a couple of jump ropes and challenge your little one to a contest to see who can skip the longest, and make up silly songs to sing together along the way! Jumping jacks. Jumping jacks are another fun way to help a child with body awareness while also working on his or her coordination skills. It take a surprising amount of skill and concentration to perform both the leg and arm movements simultaneously! Bouncing on an exercise ball. This can be very calming and centering, and since there are heaps of other great core-strengthening activities you can do with an exercise ball, I feel this is a great piece of sensory equipment to invest in, and love that you can fit one in your car for on-the-go sensory integration. Household chores. Many household chores, like carrying groceries, vacuuming, raking, and shovelling double as fabulous heavy work activities, which engage the proprioceptive system and help kids feel grounded and centered. If you’re traveling and find it difficult to incorporate these activities into your routine, another option is to have your child pull a blanket filled with toys, pillows, or other weighted objects from one end of the room to another. Weighted vests and blankets. Weighted vests and blankets are an excellent way to provide proprioceptive input while simultaneously calming a child and allowing him or her to focus. Many children say the weight of the vest mimics that of a deep hug, which can be extremely helpful for kids with proprioceptive dysfunction. I especially like these weighted vests as they are adjustable and you can change the weight as required as your child grows. Balance board. You can easily make a balance board on your own with a plank of wood and a piece of pipe, but if you’re like me and prefer to steer clear of DIY projects, this Alex Toys Balance Board is a great option. It helps develop a child’s gross motor and balancing skills while also helping them to shed excess energy and return to a place of calm. It’s also compact and portable, and once your child masters how to balance on the board, you can find other ways to incorporate this into his or her play to help further improve his or her skills. For example, you may have your child balance on the board while playing a game of catch. Spin disk. Does your child like to spin? If so, this spin disc is sure to be a hit! I get dizzy just looking at it, but I’ve heard many parents recommend spin discs as a form of vestibular input for little ones. It’s also a fun tool to use with kids who tend to avoid sensory input as it helps them become more comfortable with the feeling of movement beyond their own control. Treadmill walking. Yes, you read that right! Walking on a treadmill is a great form of vestibular input. It can help with balance and coordination, while simultaneously helping your little one feel more comfortable with the sensation of being on something that is moving, and it can also help burn off some extra steam on bad weather days. Most hotels offer a small gym to guests and, assuming it isn’t too busy, this might be the perfect sensory processing disorder activity to enjoy with your child while you travel. Scooter board. Square scooters aren’t just fun – they also help create a ton of different core exercises for kids. For example, you can have your child lay with her tummy on the scooter, and then ask him or her to navigate around your living room using only his or her feet while he or she picks up various objects off the ground with his or her hands. Another idea is to have your child sit cross-legged on the scooter and then move around the room using a broom while singing, ‘Row Row Row Your Boat’! Egg races. Whether you use a wooden spoon on a small ball you have lying around the house, or purchase a fancier egg race set for kids on Amazon, you can make this as simple or hard as you want to. Start with a basic race across the room, and then make the game more difficult by putting objects on the floor (pillows, blankets, etc.) so your child has to navigate across uneven terrain. You can also have your child switch between her right and left hands to add an even bigger twist! Fun with masking tape. If you’re looking for super portable sensory processing activities to help provide your little one with vestibular input while on the go, you will be amazed at what you can do with a little masking tape and imagination. From tightrope walking to creating complex obstacle courses, the possibilities are endless! Sensory blocks. Also known as bristle blocks, these interlocking blocks are easy to put together, allowing kids to get creative and have fun while simultaneously experiencing uneven textures. Water beads. Non-toxic and safe for toddlers, water beads are a very calming sensory activity for kids with SPD. Soak them in water overnight for hours of calming sensory fun! Once your little one is used to the sensation of the water beads on his or her hands, equip him or her with tools to allow for scooping, counting, and sorting (this motor tool set is a great one! ), and consider adding other ingredients like shaving cream to give an even bigger sensory experience. Kinetic sand. While playing with sand can be a very calming sensory processing disorder activity, it can also be very messy, which is why I love kinetic sand so much. It feels almost identical to sand and can be squished and molded, but it sticks together and creates zero mess, making it the perfect on-the-go sensory activity for little hands. This kinetic sand set comes with 17 different tools and molds for hours of sensory fun! Finger paints. While a tad messy (LOL), finger painting is another fun way to expose your child to different textures and build up his or her resistance in a fun way, and since finger paints are inexpensive and compact, they can easily be packed in a bag for fun at grandma’s or in a hotel room. Fun with shaving cream. If you like the idea behind finger paints but not the mess, shaving cream is another option to consider as it doesn’t stain like paints do, and can be easily washed off of fingers and clothes. Menthol shaving cream also has a distinct scent to it, adding another layer of complexity for sensory sensitive kids. Spray a bunch on a clean cookie sheet and let your child draw letters, numbers, and pictures with his or her fingers, or use a Q-Tip for added hand-eye coordination practice. Playdoh. A list of sensory processing disorder activities wouldn’t be complete without playdoh! With so many playdoh playsets and tools to choose from, your little one will enjoy hours of sensory fun while simultaneously building the hand muscles needed for fine motor tasks like writing! Playfoam. A fun twist on playdoh, playfoam is a great sensory learning tool that promotes tactile learning. Kids can squish, roll, and mold, and since playfoam doesn’t stick to surfaces and never dries out, it’s another one of my favorite portable sensory processing disorder activities for kids! Bowling. Bowling is a really fun way to help your child work on his or her hand-eye coordination. You can enjoy this as a family at an actual bowling alley, purchase an inexpensive set of bowling pins, or make your own with water bottles. Consider using a bigger ball at first to increase the likelihood your little one will knock down pins and maintain his or her motivation, and then slowly decrease the size of the ball you use and the distance your child stands away from the pins to make it more challenging. Puzzles. Puzzles offer a great way to help a child develop her hand eye coordination. Peg puzzles and chunky puzzles are a great place to start, and then you can move onto age-appropriate jigsaw puzzles. Scissor practice. If you’ve ever tried to teach a child how to cut with scissors, you know it’s not quite as simple as it sounds as it requires children to use both their fine motor skills and their hand-eye coordination. A great way to get started is to ask your child to practice cutting playdoh with a pair of playdoh scissors. It’s not quite as challenging, which will make the experience more positive and less frustrating. Fun with pipe cleaners. Another portable – and inexpensive – sensory processing disorder activity that helps develop hand-eye coordination is pipe cleaners. Sounds weird, I know, but there are so many things you can do with a basic pipe cleaner to help develop your child’s skills. You can thread them through the holes of a colander, slide beads onto them, cut them in half and ask your child to drop them into the neck of a water bottle…the possibilities are endless. Lacing boards and beads. Another one of my favorite sensory processing disorder activities is lacing. Whether you splurge on a set of lacing cards, invest in a jewelry-making kit, or simply give your child some string and some pasta tubes, lacing is a great activity to help kids develop their hand-eye coordination, and it doubles as a fantastic travel activity. Playing catch. If your child struggles with his or her gross motor skills and finds activities that require hand-eye coordination difficult, taking the time to practice his or her catching skills can be highly beneficial. Have your child practice throwing bunches of socks into a laundry hamper while you’re folding laundry, and keep a small ball in your purse and car so you always have something on hand to play with when you’re out and about and need a way to connect with one another and blow off steam. I hope this collection of simple, inexpensive, and portable sensory processing disorder activities and toys inspires you to find ways to support your sensory sensitive child at home, at school, in therapy, and while on the go. Remember to consult with a licensed occupational therapist to confirm your child’s diagnosis and address his or her individual treatment needs, and to keep things light and fun to ensure ongoing success. Be patient, celebrate every milestone, and support your child when you find him or her struggling. 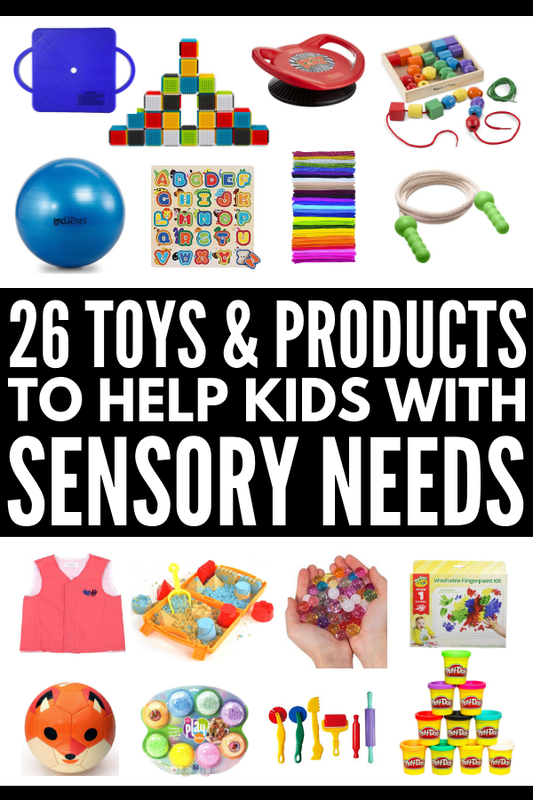 If you found this collection of sensory processing disorder activities and toys helpful, please share this post on Pinterest! And if you’re looking for more tips and tricks to help your child with sensory processing disorder and/or other special needs like autism, please follow our Special Needs board where we share all kinds of helpful ideas we find each day!